We should all have seen it coming. After the Tories’ win in last year’s UK election, and Britain’s unexpected Brexit vote earlier this year, at least those of us on this side of the pond should have viewed the numerous projections and predictions made by a seemingly endless number of ‘expert’ websites and pollsters with a healthy, hefty pinch of salt. Instead we awoke to outpourings of shock, rage, sadness and – yes – joy as Donald Trump confounded nearly all professional opinion and found a path to The White House. It’s difficult to meet someone who doesn’t have an opinion on America’s new President-elect and it’s even more difficult to meet someone who’s prepared to change their mind about him, so it would be somewhat less than pointless to add another hatchet job to the already extensive reading list. Besides, this particular horse has already bolted. What is intriguing – whether you see this as the darkest day in modern American history, or the silent majority’s long-overdue battle cry of freedom – is how the Trump candidacy defied all logic and political wisdom to overcome what always seemed insurmountable odds. The answer is likely to be deeply uncomfortable for middle class liberals like me, as the parallels between Trump’s victory and Brexit run much further than polling errors. The 2016 US election has long been seen as a ‘Cry Of Rage’ from forgotten America in a similar way to how the Brexit victory is seen by some as a silent revolt by those marginalised and taken for granted here in the UK. I believe there’s more than a grain of truth to both interpretations. In Britain the liberal left have long taken working class support for granted. Any mention of immigration from large swaths of the electorate has never prompted an open, honest debate about its benefits to our economy. Instead, liberal/left politicians have sniffed about working class ‘racism’ and ‘bigotry’ and declined to engage. This patronising approach to the country’s own citizens has left a vacuum to be filled by the fear of foreigners espoused by the likes of UKIP, Britain First and even sections of the Tory Party. Given this dereliction of duty and refusal to listen to real people, Brexit was actually no surprise. When a large group of people who are poorer than they were, more marginalised than ever and largely ignored by “the establishment” were given the opportunity to give those who think they know better a good kicking, what did we think would happen? It’s a similar story in 2016 America. Large expanses of the United States, particularly away from the major cities, have struggled with globalisation and the growth of technology. Many communities are poorer now than they have been in decades as their industries have declined and nothing has been done to replace them. Add to this the fact that there are many rural values in America that are directly the opposite of the ‘metropolitan liberal elite’ – religion, gun ownership, abortion and so on – and it’s not so difficult to see the beginnings of a political tinder box. The traditional Democratic and Republican parties have had little or nothing of substance to say to these communities beyond patronising platitudes and so, just like Brexit, a vacuum has formed. It was within this landscape that the metropolitan billionaire Donald Trump was somehow able to portray himself as an outsider, while Hillary Clinton, aiming to break the glass ceiling and become America’s first woman president, somehow ended up as the establishment figure. Trump’s message to disaffected America was a very simple one: I hear you, and no one else does. Many Trump supporters were well aware of his reputation and his temperament. They could clearly see the narcissism, the chauvinism (both gender and racial) and probably never believed for a minute that he would build a wall on the border with Mexico (Trump’s £350m pledge?) but here was a man promising to kick the establishment’s door down. When everything else has failed and you feel angry and ignored it’s not too difficult to see how that message becomes attractive. The result was a stunning change in American politics in which the Republican Party became a right wing party of the poor pitted against the Democrats who became seen as a left wing party of the rich. Clinton’s link to Wall Street and the like only helped confirm these perceptions. Will a Trump presidency really be as terrifying as “we” seem to think? I think it’s unlikely, although there’s no doubt we will have to watch much of it through our fingers. As Toby Zeigler says in the West Wing: “You campaign in poetry but you govern in prose”. Trump’s campaign was never poetry of the most beautiful kind but his governing agenda will surely need to be more prosaic due to the US constitution’s checks and balances. What is clear is that he will be surrounded by some very clever tacticians who will already be working towards re-election in 2020. What is less clear is what condition the Democratic Party will be in in four years. The Democrats have re-invented themselves in the past – they used to be the party of Southern slaveholder privilege – but do they have it within them to do so again? The first thing they’ll need to do is start listening to the communities across America who clearly felt Donald Trump was a better bet. And so the government has won the controversial tuition fees vote 323 to 302, giving them a majority of 21. While the Tories have escaped much of the spleen-venting over the issue (presumably people expect them to live up to their billing as ‘the Nasty Party’) the whole issue has torn the Liberal Democrats apart. I have to admit to being fairly agnostic over the fees debate. I’d love to see a system where everyone could have a free university education, but equally I don’t think that the Coalition’s extension of (let’s not forget) Labour’s policy is the end of society as we know it. I don’t even blame my own party for making the concession during the frantic negotiations after the election in May – the Lib Dems didn’t win the election and therefore don’t get to have their own way within a coalition government. Having said that, if you allow yourself to be photographed gurning over a signed pledge to vote against an increase, then vote against is what you must do when the time comes. And here (among other things) lies Nick Clegg’s problem. 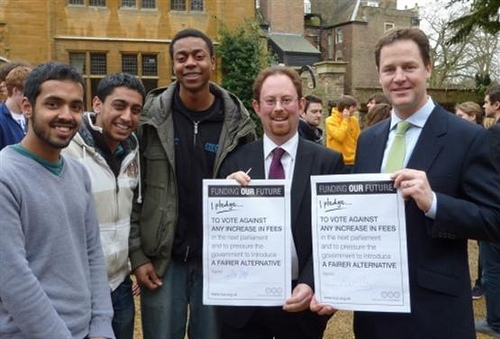 As long as people are able to stumble upon the photo above, the conclusion will be drawn that Clegg was more interested in the trappings of power than sticking to the clearest promise he made in the run up to the General Election. No matter what happens now, no matter if the Coalition turns out to be the finest government this country has ever seen (stick with me on this) Clegg will always have this image hanging round his neck. Some good might come out of this. The Lib Dems will have learned a harsh lesson to “think hard before you pledge” – something that parties who are used to government have known for a long time. And I hope that those who have been so quick to condemn will recognise that many Lib Dem MPs (including my own, Dan Rogerson) did what they promised to do and voted against the government. But, try as I might, there’s no way I can spin this as anything other than a bad day for my party. In an ideal world I don’t think I’d have much to do with the Alternative Vote method of electing MPs, the option which will be put forward in next year’s referendum on Electoral Reform. I’m a long-standing believer in Proportional Representation and, whatever the merits of AV, it is certainly not proportional. All MPs would have the support of a majority of their voters. Following the 2010 election 2/3 of MPs lacked majority support, the highest figure in British political history. It retains the same constituencies, meaning no need to redraw boundaries, and no overt erosion of the constituency-MP link. It penalises extremist parties, who are unlikely to gain many second-preference votes. It eliminates the need for tactical voting. 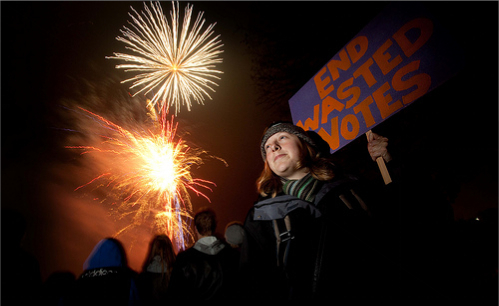 Electors can vote for their first-choice candidate without fear of wasting their vote. It encourages candidates to chase second- and third-preferences, which lessens the need for negative campaigning (one doesn’t want to alienate the supporters of another candidate whose second preferences one wants) and rewards broad-church policies. Additionally the AV system would reduce (although not eliminate) the number of safe seats in the British Parliament. It is no coincidence that the worst excesses of the MPs’ expenses scandal occurred in the safest parliamentary constituencies – security seemed to breed a lack of accountability, complacency and contempt for the electorate. Those who argue against the fairer votes campaign will tell you that FPTP is a simple system which provides strong government. The first part of that argument is true – FPTP is a simple system. However, the inference is that AV is complicated. This is clearly not true. The arrogance of many behind the ‘No’ campaign is clearly demonstrated by their view that voters are somehow not bright enough to be able to number their electoral preferences 1, 2, 3 etc. As for the suggestion of strong government only being possible through FPTP one only has to look back to the Brown, Major and Callaghan governments to demonstrate that, in recent years, this is not a given. There is bound to be a heated debate in the run-up to next year’s poll and a taste of what’s to come can be seen by the choice of figureheads for the ‘No’ campaign. A selection of dinosaurs seems set to be wheeled out to tell us all, in essence, to leave things as they are because they know best. By contrast the ‘Yes to fairer votes‘ campaign offers an optimistic view that it just might be possible to change politics for the better. Nick Clegg once infamously described AV as “a miserable little compromise” and to a certain extent he was right. I would far sooner see a referendum option on the Single Transferable Vote but the simple fact is that no such choice will be on the ballot paper. Britain will have a choice on 5th May 2011 whether to persevere with a system which worked well a century or so ago, but which seems a poor fit in the modern multi-party political framework, or to at least take a step in the right direction by – finally – making sure everyone’s vote counts. And what could be simpler than that? In 2004 the journalist Adam Curtis made an excellent series of films for the BBC called The Power Of Nightmares: The Rise Of The Politics Of Fear. In those films he made the point that, back in the 1950s, politicians ran for office with a positive agenda, promising to make our lives better through forward-thinking initiatives – by the 2000s the message had changed to a promise to protect us all from the dark and unquantifiable threat of international terrorism. This week’s terror alert has shown that, while the political colours in both the White House and Downing Street may be different from the Bush/Blair era Curtis talked about, the 21st century message of ‘be afraid, be very afraid’ is never too far from the surface. In the wake of the ‘Cargo Bomb Plot’ voices have inevitably been raised in the UK and America, calling for tighter worldwide security measures and a heightened state of alert to protect against the global machinery of terror. Just as inevitably, there will soon be calls for more domestic legislation giving ever-greater powers to the organisation of government. Mercifully, so far, the governments on both sides of the Atlantic have shown a little restraint in their tone but, as Andrew Rawnsley wrote in this weekend’s Observer, how much pressure will it take from vested interests like the head of MI6 before the encouraging Lib Dem and Conservative noises in Opposition are brushed aside when it comes to decisions over, for example, the control orders regime? A sensible, informed debate about the balance between security and liberty would be most useful right now. I don’t wish to belittle the very real danger that the ‘Cargo Bomb Plot’ presented. There can be little doubt that there are all manner of ‘terrorist cells’ trying their hardest to garner the worldwide publicity that a major atrocity would have afforded them. Where I struggle is with the suggestion that there is a highly organised global network of terror, masterminded by Osama Bin Laden, operating under the banner of ‘al-Qa’ida’. I’m no natural enthusiast for the conspiracy theory. I’m certain that NASA landed on the Moon, that the death of Diana was a tragic accident and that Lee Harvey Oswald really was the man who pulled the trigger in Dallas on that November day in 1963. Similarly I don’t believe that the US government was complicit in the 9/11 outrage, other than through its incompetence. Nevertheless, it is abundantly clear that the Bush administration used the fallout from the attack on the World Trade Center to unite the western world against a common enemy, in the same way Ronald Reagan painted the ‘Evil Empire’ myth of the Soviet Union. Bush, Rumsfeld, Wolfowitz and the global arms and oil corporations used this fear to push their hard-edged neo-conservative agenda. The damage, in Iraq and Afghanistan, was both massive and utterly counter-productive. The onus is now on politicians on both sides of the Atlantic to ensure that the climate of fear which led to those campaigns is not fostered again in pursuit of an enemy which bears no relation to the image painted by those whose motives are considerably less than pure. In many respects the statement was reminiscent of the Gordon Brown Budgets after 1997 – expectation lowered in the press in the lead-up to the announcement, final proposals that don’t seem too bad compared to what was feared, and a well-spun political presentation of the end result. Brown’s Budgets also had a knack of unravelling in the days after the announcement as those in the know started to probe the detail, but we’ll have to wait to see if Osborne’s statement goes the same way. In spite of the spin, there will still be savage cuts. Police budgets will be cut by 16% over four years, councils will face cuts of nearly 30%, and the Home Office and the Ministry of Justice will see their budgets cut by 6% a year. And, regardless of Osborne’s wearying claim that “we’re all in this together”, it seems very clear that those most well off (including those – like Gideon – who live off £4m trust funds) will hardly see the same destructive effect on their lives as will surely be suffered by those at the other end of the income scale. Indeed, the Institute for Fiscal Studies is already highlighting the review’s harshest impact (surprise surprise) on the poorest in society. Submerged in all the talk of spending cuts, the details of the Coalition’s shafting of the BBC also came to light this week, thereby completing the first part of the Conservative Party’s Faustian pact with Rupert Murdoch. 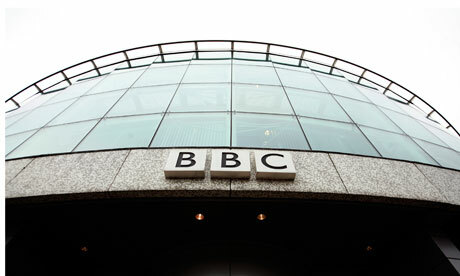 As the Guardian outlines here the licence fee will be frozen for six years, which represents a real terms cut of 16%, and out of the reduced budget the BBC will have to divert money to the World Service (currently funded in part by the Foreign Office) and Welsh language broadcaster S4C. It’s perhaps quite telling that the BBC had privately feared far worse. The second, and potentially even more alarming part of the Murdoch appeasement plan is still to come and relates to the media giant’s desire to assume complete control of BSkyB – a move which will be decided on by the Business Secretary (and erstwhile darling of, well, just about everybody) Vince Cable. As David Puttnam passionately argued in The Observer last month, the delicate balance of the British media and therefore the framing of debate in this country is under serious threat from this proposal. These are pivotal moments for the future of the media in the UK. Commercial broadcasters have always complained about the dominance of the BBC, often with some justification, but the Murdoch approach is a rather different beast altogether. Not content with a simple wrecking ball approach to the Corporation (enthusiastically wielded by the Coalition) he also wishes to consolidate his grip on the British commercial media at a time when no one is really certain about how broadcasting or the press will evolve in an age when the internet continues to expand at an almost exponential rate. As the FT’s Martin Wolf argues, Vince Cable has a golden opportunity to try to restore some semblance of ‘fairness’ to the Coalition’s already tarnished reputation. One can only hope that he puts a stop to the impression of the timidity of the Coalition (and indeed, every government since 1979) around the Murdoch empire. The government has showed its willingness to ‘fearlessly’ wield the axe on public services – an ounce of that determination should now be directed towards resisting Murdoch. The consequences of the cuts are not yet fully understood, but protecting the plurality of the British media surely has to be that rarest of bonuses for the Coalition: a relatively easy win. Steve Richards of The Independent tweets that we should not be surprised if George Osborne performs a u-turn over the controversial Child Benefit cut for high earners announced at the Tory Party Conference this week. The point Richards makes is that, while in Opposition, Cameron and Osborne quite frequently ‘flip-flopped’, to use the dreadful American parlance, at the first sign of serious media scrutiny of policy. “They are weak” he writes and, for all the tough rhetoric on tackling the deficit, there is more than a grain of truth to the remark. My sense from the outside is that Osborne will probably stick by the announcement on child benefit, in spite of the rage from certain sections of the press, and try to paper over the cracks by making the sort of vacuous, moralising intervention on marriage that has already been indicated. I may not know a great deal about Osborne’s mindset but experience demonstrates that, given a range of options, instinct normally leads him towards the wrong one. Perhaps the middle class outrage at the (frankly quite messy) changes to Child Benefit is the start of something faintly encouraging. I don’t mean in the sense that Women’s Institutes the length and breadth of Britain will start to become more politically engaged, but that – finally – there is a flicker of scrutiny of Tory policy from the party’s friends in the right-wing press. This is unlikely to unleash a full-scale examination of the darkness at the heart of the Conservative world view – the Mail, Telegraph and Murdoch propaganda sheets know where their bread is buttered – but the press may yet find it hard to supress their natural instinct to hunt down an individual when they scent weakness. 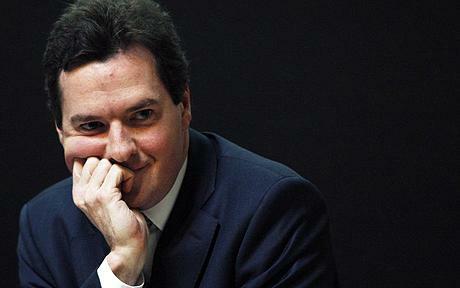 Osborne may have some difficult months ahead of him. 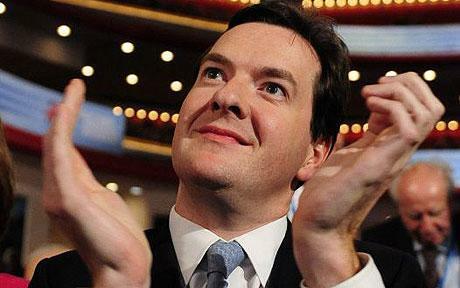 It’s hard to see how Osborne can find himself in a position to pull any rabbits out of the hat. The economic situation is bleak and by any measure he was a strange choice for Chancellor given the options available to David Cameron when the Coalition was formed. Both Vince Cable and Kenneth Clarke were clearly better qualified for the job and there can be little doubt that Osborne holds his position (arguably the first ‘proper’ job of his life) purely as a result of the personal loyalty of the Prime Minister. Such loyalty is worth a great deal of course, as the continual, bewildering survival of Andy Coulson demonstrates, but is it really doing anyone any favours? The coming months will test the Coalition to breaking point. The government will inevitably become increasingly unpopular as the cuts start to bite, and much pressure will fall on the Liberal Democrat involvement, depending on next year’s elections and the outcome of the AV Referendum. Crucial at such times is the work and vision of the Treasury, as the fulcrum of the business of government. The biggest worry for the Coalition must be that so much therefore depends on the wisdom – or otherwise – of George Osborne.